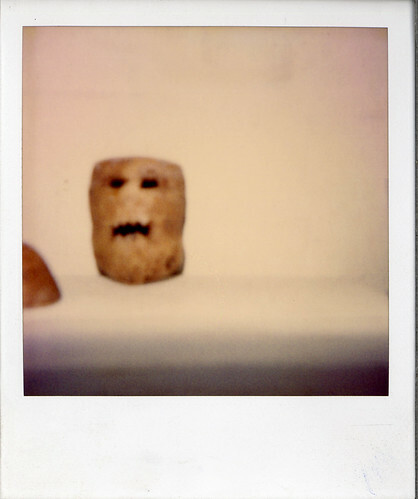 potato polaroid 2, 1989, martin bromirski, originally uploaded by Bromirski. Tonight we examine the potato year, 1989. This year is not officially part of the quarter-career (1990-2005), but the potatoes were fun and I want to show them. Pictured above is one of my potato polaroids. I made potato jack-o-lanterns and let them wizen and harden. Very scary. You may also like the paintings of the boxing potatoes, the elvis potato (very Basquiat) and the texas potatoes. There were so many other potato paintings - there was the potato mystery train and the celestial potato - now so many of these are feared lost. What is the difference between the potatoes and the meatballs? Nothing! They are all delicious. Ed Holten, originally uploaded by Bromirski. Friday night's Sculpture Invitational was a good time and a long walk. Our group (I think there were a few different groups) was much smaller at the end than at the beginning, and I'm sorry to admit that we even skipped a couple pieces. It was enough that - following the map - we had to walk from 2nd Street to 12th Street to get from the fourth to the fifth piece. One of the pieces I missed seeing was Frederick Chiriboga's, something that was highly recommended in the comments to this previous post, so I will make a point of biking back and checking them both out. That said, it was a nice walk around a part of town I rarely visit. I had no idea the Bainbridge Art Center, host of a wild piece by Greg Kelley, even existed. We arrived at the last piece, Jeffrey Loy's, at the perfect time, dusk. The light globes at the top of each of his three art-nouveau-like pieces turned colors in the dark under a tree. It was a bit like watching fireflies. Very nice. Two of my favorites were Tom Chenoweth's Tesla and the Ed Holten pictured above called Safety Passes Over. Chenoweth's electrical-tower monument to three pioneers of electricity, Hertz, Tesla, and Van de Graff, was placed in a parking lot near some old electric factory buildings (or something). Can someone send me a photo to post? This is a picture of the work-in-progress. Ed Holten's piece is kooky and fun. 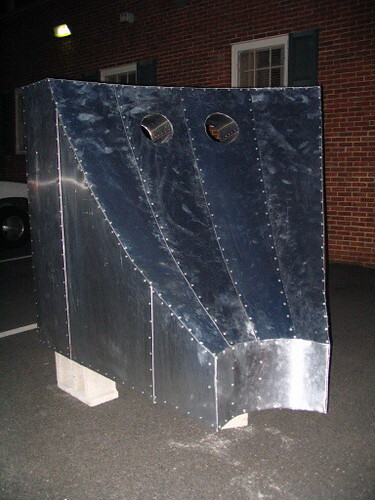 Our first instinct was to stand behind it and put our faces in those portholes, like getting your picture taken at the fair as a muscleman or cowboy. What are those things called? Holten was there and said he was thinking of the shape of dams. I'm not sure if they are part of the piece or not but I really like the gray cinderblocks with the silver sculpture. Here's a picture of Margery Albertini talking about her piece. butterheads, originally uploaded by Bromirski. Some butterheads and celebrity seedfaces at the Minnesota State Fair. Here's a creepy close-up of one of the smiling butter princesses wearing a sparkly silvery tiara. I happened across these last night and saved them to my flickr account but now I can't find the original website. Today I find that Mountain Man has posted some art and demolition derby photos from his own visit to a Pennsylvania fair! UPDATE - still can't find the original site but it may be on one of the many bizarre pages of this website of photos by the photographer, Craig S. Thom. Am I allowed to post that butterheads photo? I don't understand the rules. Had a good time walking around the Manchester Arts District Friday night on the Sculpture Invitational's walking tour. I'll talk about that in a later post but for now I want to spotlight some more artists from radius250. The walking tour started at artspace and I had a lot of time to re-examine that large show and notice some good things I didn't fully catch the first time. Two artists recommended in the comments of the previous radius250 post are Amy Lincoln and Joshua Rickards. Both artists are painters showing thinly painted works. Rickards has two very small paintings straddling that line between the scrappy and the crappy - one is a cloud dripping a rainbow of pale colors and was like a more hazy empty Ben Woodward piece, the other is a weird one with a middle-aged shirtless guy holding a sword. He's painted off to the bottom left side, like a sketch you'd find in a high-school notebook. The hazy beigeness and materiality of these pieces is very nice. Amy Lincoln's washy direct portraits have a strength, honesty and emotional assertiveness missing in so much of the scrappy. They are slight without being glib, like Elizabeth Peyton but with more emotion. A little less style and a lot more soul. Todd Scalise - has a graphic latch-hook rug piece called The Prophet. Nothing to say about it but that I liked it. Michael Seal - I hadn't noticed these at all on my first visit to the show. He has three open "books" on a low pedestal which are actually frames for small black and white photographs - I say photographs but they are in fact something called an ambrotype. These small photos are of a very tiny figure wandering through a forest of pillars and monuments, the tops of which all feature huge lumpy portrait busts of probably the same person. These have a funny scale thing because the pillar-scapes feel like miniatures but to the tiny figure wandering among them they are monumental. Also you have to bend over and peer into the book to get a good look at them. Monica Palma Narvaez - this artist's work remains my favorite of the show. Here's the short statement that accompanies her photographs - "after arriving in Richmond from Mexico, I noticed some posters in the street that talked about citizen vigilance in the neighborhood. 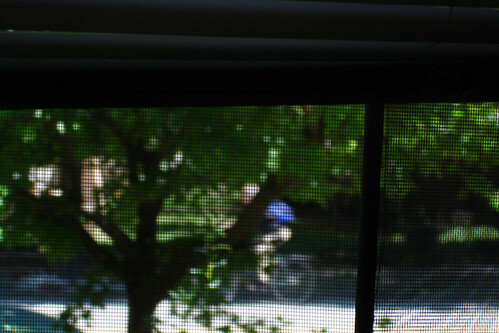 I decided to assume my neighborly responsibilities and monitor the activities in the street seen from my front window." 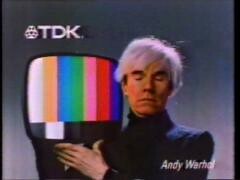 Andy Warhol's Japanese Televison Commercial, originally uploaded by Bromirski. On the occasion of the Andy Warhol Foundation's decision to license Andy's images to Levi's and Edward Winkleman's post on the foundation's previous post-mortem licensing deals I want to share a very funny old television commercial. In case you don't speak Japanese, he is saying the names of colors, and then he says "pretty". It's hilarious! His pronunciation is awful. I've previously recommended subscribing to Charles Giuliano's e-mailed art magazine Maverick Arts and now I'm happy to announce that he has established a website! Make sure you check out the archives, they go all the way back to 2000 and cover shows not just in Boston but also Giuliano's many visits to NYC, Europe, and elsewhere. Caryn Coleman, you would probably like this recent installment, excerpted below, with curator Linda Norden discussing Ed Ruscha. "I went out to LA,” she said and met with the artist. “Ed had wanted to do Venice for the past 30 years. He loved the building as well as the prestige of the Biennale. He said ‘What do you do?’ I said ‘I think it is crucial that the project be really specific to the space. I knew the building and we talked about its symmetry. Donna (Desalvo) suggested that we leave the rotunda empty which we did. I thought it was important that people not feel that they had seen the work before. He made new work for the installation. I particularly liked the earlier ‘Blue Collar’ series which was done in black and white (based on photographs of industrial landscapes). He said ‘How long will you be in LA’ and I answered ‘About a week.’ He said ‘Come back in 48 hours.’ He subsequently created a new series of works, in color, that relate to the original 1992 series." Can that be right? He made those Venice Biennale paintings in 48 hours? That must be just some initial sketches or something, right? Tomorrow night is the opening reception and walking tour for the first (annual?) Sculpture Invitational. It starts at 6:00pm at artspace and ends at Legends Brewing Company. If you can't make the opening night walk you can always get a map and do it later, the invitational runs through October 20. Style Weekly's Shannon O'Neill has an article out this week with more info and introducing some of the artists. The article makes mention of my previous Sculpture Invitational post and refers to that as a "public-relations setback". Sorry, I thought I was offering some good ideas - and I do think this is great and am excited about it. Why does it so often seem that if you don't cheerlead for something 100% you are perceived as being against it? I would like to see Allison Smith's Muster invade Monument Avenue, it would be perfect. I'm glad to see that the end of O'Neill's article does address my valid criticism of a fourteen artist invitational that includes only one woman. Actually, in thinking about the history of Richmond public sculpture, I was also wondering how many black sculptors were included. Richmond is a city that is nearly 60 percent black but I am hard-pressed to name a local black artist. Or a single black faculty member or black grad student in any department of VCU's fine arts program. I want to formally announce that I am at a quarter of a career. I'm at a point where I've started to take note of different artists (see below) being referred to as "mid-career", and some of them haven't been working much longer than I have. This frightens me because they are famous and I am struggling. Maybe I missed the boat. Check out my latest rejection. I need to buy some time to catch up or something to some of these midcareer artists only five years older than me, so I'm declaring myself at a quarter of my career. My mid-career point will be in 2020 when I'm 52. It's all done in fifteen year increments. I'm finished in 2050 when I'm 82. Here's my resume. Am I still an "emerging artist"? I guess so. The best definition I have seen yet of "emerging artist" is Dieu Donne's "an artist who is professionally unrecognized but stylistically evolved". What is the opposite called, an artist who IS professionally recognized but NOT stylistically evolved? I know they exist! Does anybody have a suggestion? I am ready for my Quarter-Career Retrospective if any museums want to get in touch with me. 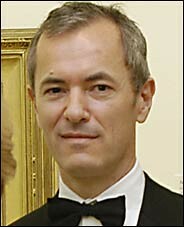 Richard Polsky refers to Tony Fitpatrick as a mid-career artist. Fitzpatrick was born in 1958 and has been showing since 1985. The Whitney's press release and Susan Freudenheim's 2/13/05 NYTimes review both refer to Tim Hawkinson's Whitney exhibition as a being a mid-career show. Tim Hawkinson was born in 1960 and has been showing for two decades. Arthur Lubow's 04/03/05 NYTimes Takashi Murakami profile announces a midcareer retrospective of the artist at LA's Museum of Contemporary Art scheuled for 2007. Murakami was born in 1962. Michael Kimmelman opens his 3/4/05 NYTimes Thomas Demand review with the sentence, "a dozen years ago, Thomas Demand, whose generally stellar midcareer retrospective opens today at the Museum of Modern Art, was studying in London, at Goldsmiths College." Demand was born in 1964!!! Andrea Fraser was born in 1965 and had a midcareer retrospective in 2003. "a mid-career visual artist — defined as an artist who has seven or more years of active professional participation in his/her field. Artists must have documented exhibition history, publications or other significant proof of professional accomplishments." "an “emerging” visual artist — defined as an artist who has up to seven years of professional experience in his/her field. Artists must demonstrate outstanding artistic ability and potential to rise from a challenging or obscure position or condition in the community." Monica Palma, originally uploaded by Bromirski. Above is one of the four photographs Monica Palma Narvaez has included in the radius250 show. Her four photos are all "surveillance" shots of unsuspecting passerby taken from the safety of home - through screens and between blinds. Here's another one from the series that is not included in the show. Narvaez moved to Richmond from Mexico about eight months ago to join her boyfriend (now husband) and this work of an immigrant keeping tabs on Americans is an interesting twist. For me they also bring to mind the paranoid psychologist Dr. Fielding from Ann Sofi-Siden's Qm, I think I call her Qm as well as a summer a few years ago when my girlfriend and I sublet a place in Philadelphia. We were visiting from Japan and I know that she spent a lot of very bored afternoons looking out the window waiting for me to come home from work. Althea Murphy-Price - she has made something that looks like an Afro-hat/helmet/teapot/wig. Here's an image but you can't get the hairiness of it. This is for a lady with long curling fingernails. I know a lady named Laverne who might want to wear this to church. Is it her hat? Is it her hair? Is it a wig? Laverne won't say! Oompa-loompa! This relates (for me) to Ellen Gallagher's plasticine hair stuff. Robert Rainey - Robert is showing what appears to be a bland suburban family portrait of parents and son sitting on the front steps. Note the screaming little girl locked inside not allowed to take part in the photograph (very hard to see on the web). It gets a little creepier if you know gay Robert is posing as the father. Beq - this painting is awkward good. Strange. Nice size and scale. Can't figure out if I like it or not or why. The calligraphy is distracting. The show has gotten some press in both Style Weekly and the Richmond Times Dispatch but without making much mention of specific works. Does anybody have a favorite or least favorite they'd like to mention in the comments? i want to make goods!!! John Baldessari, Louise Bourgeois, Marcel Dzama, Rodney Graham, Arthuro!, Jenny Holzer, Komar and Melamid, Jeff Koons, Kusama Yayoi, Sol Lewitt (so fancy! a scarf also! ), Kerry James Marshall, Takashi Murakami, Yoshitomo Nara, James Rosenquist, Julian Schnabel, David Shrigley, Laurie Simmons, Haim Steinbach, Lawrence Weiner. I want to make something like a nativity scene of my One Day in the Garden characters. They would be white ceramic with gold trim. 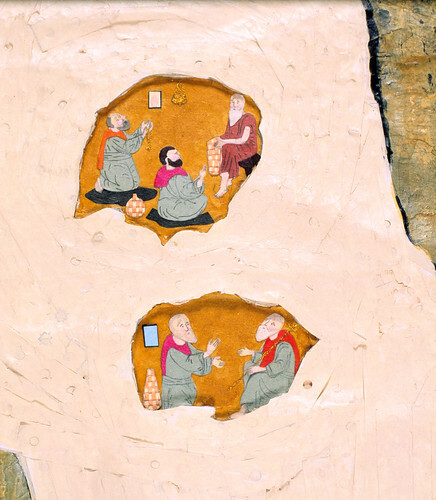 A white ceramic gold-trimmed log and a ceramic or wooden pipe. Maybe a Czechoslovakian crystal caterpillar husk. Elegant! Also some Capodimonte style One Day in the Garden lamps. Gorgeous!!! One Day In The Garden, page 20, originally uploaded by Bromirski. 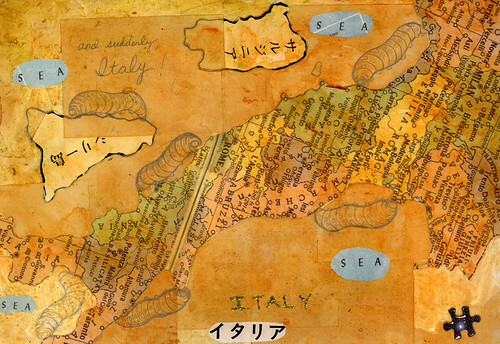 page twenty - then suddenly, Italy! Hilton Kramer has published a response to Roberta Smith's ridiculous review of the Jean Helion exhibition. little people, originally uploaded by Bromirski. Finally! I've scanned the slide that has the little people! The top cave is about three inches around and the bottom cave is 2"x3". The people are made of mostly cut paper, I had to use tweezers and a magnifying glass - those pink cheeks are TINY. The three baskets are really woven - I made a very tiny tiny weave and cut out the basket shapes. Here is a much better even more zoomed-in look. 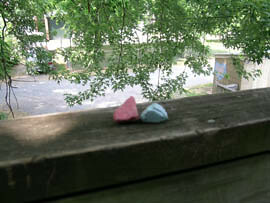 Those guys are the shinto spirits of the scholar's rock. They're everywhere! The whole painting is here. Thumbs-up from William Bailey! Thumbs-up from Pat Adams! Richmond's Virginia Museum of Fine Arts Director Michael Brand has been named new Director at the Getty Museum. Brand is a native Australian and has been here in Richmond for five years. For much more information and thoughts on Brand and the Getty please check out Tyler Green and Edward Winkleman along with their links to a couple NYTimes articles. Who will be our new Director? "other standouts in the show include Melanie Stidolph’s large-scale digital photos and Sarah Bednarek’s screenprinted couch. Stidolph’s picture of a white horse and its foal has a strange intensity (due in part to its ethereal, washed out color-scheme) that refuses to be immediately characterized as "doing" this or that. The sincere beauty of the photo counterbalances the My Little Pony irony of the subject matter. Bednarek’s couch rises above a great deal of the "crafts"-oriented work one sees today, largely because of her talent for understatement. The piece features a repeating pattern of woodsmen, hooded flag bearers, and shotgun-toting thugs in various sylvan settings, tricked out in a nauseating shade of forest green. All of this might have ended up as simply sarcastic in less capable hands. But the bland subtlety of the figuration lends the work an eerie normalcy–it would be easy to have a seat on the couch without even noticing the creepy cast of characters in their paramilitary Arcadia"
Bednarek and Stidolph were my two favorites from that show too. X on Relativity for NYArts Magazine - My look at the same show here and here. Unfortunately I never got around to writing more specifically about the work of Sun-Tek Chung and Chris Norris, but I understand they will be showing together this fall at ADA Gallery. I'll try to get to them then. X on Katharina Grosse for NYArts Magazine - I blogged Grosse's lecture here and here. More photos of the installation are here. Who is this X and how is it that he missed Meatballs at Stuffy's??? Oh wait, X is working for VCU and the two shows he covered are VCU shows. How much money is VCU indirectly paying for these reviews? Maybe I should save up and buy one too? X previously covered a VCU rental show in Beacon for the NYTimes - I don't think he was working for VCU yet. In the comments to one of last week's posts artist Bill Gusky says "the few truly useful art critics remaining, for me, are the artist-critics, in particular Joe Fyfe, Chris Martin, and Stephen Westfall (does Westfall still write? ), and, to some degree, Eleanor Heartney". I included Merlin James in that group and asked "okay, that is four painters who also write art criticism - mostly about other painters. What about non-painters? Artists in other mediums?". An anonymous commenter added "what about female artist-critics? I hate this crowd of guys idea". Can anybody recommend some other good artist-critics? Related - Joe Fyfe for artcritical.com, Chris Martin on abstract painting for the Brooklyn Rail, Stephen Westfall for Art in America, Merlin James on Jean Helion. PS - Is Heartney an artist also? 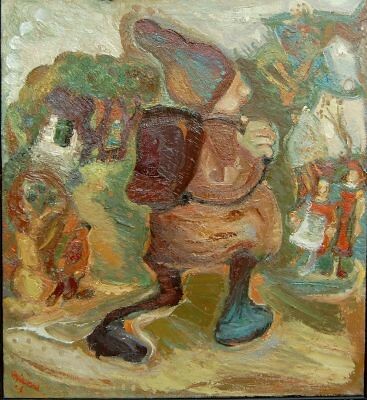 Andreas Thieme, Scholkind (Zustansfoto), 2003, originally uploaded by Bromirski. Looking at Hans Heiner Buhr's blog I came across this post on his friend and former teacher Andreas Thieme. I looked at Thieme's website and while I wasn't into all of it I really liked Gaukler am Meer, Maler mit zwei Modellen, and Scholkind (Zustansfoto) - the one pictured above. Roberta says "if the scale was tiny they'd be sweet. if it was huge they'd scare me". Thieme will be showing in Zwickau at the Galerie am Domhof on October 18th. Diana Al-Hadid, originally uploaded by Bromirski. Alessandra Torres is one of the artists participating in WPA/Corcoran's Seven and photographer James Bailey has just posted an interview with her on Black Cat Bone. Diana Al-Hadid is showing at Irvine Contemporary until September 3rd. Richmonder Suzanna Fields is in that show too. 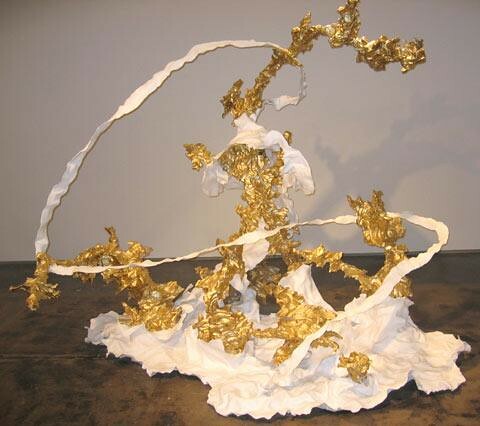 Diana is also included in the MFA Graduates Exhibition at the Arlington Art Center. Other recent VCU grads in that MFA Graduates Exhibition are Sarah Bednarek, Megan Biddle, and Timothy Michael Martin. I had thought JT was saying some good things about Mike Martin in his review but he backed way off in his comment to my post here. Sorry, Mike! I'm a little confused about what JT thinks now because it sounds like he's saying he doesn't really like Mike's work but thinks that "priced at a mere $1,200" it is a good buy. I'm especially confused because back in the fun comments of this post JT seemed to be arguing that Jim Houser's work was priced way too high at $2,000 (Houser was having his fourth solo show at Philadelphia's Spector Gallery). Now I have no idea how JT decides something is priced well if he isn't basing his decision either on how much he likes the work or what an artist's track record is; $1,200 for a painting by an artist just starting out is too low but $2,000 for one by an artist with a good reputation having his fourth solo show at a large city's well-regarded gallery is too high? I don't get. Coming up in DC is that prestigious MFA show Options 2005. P.S. - not DC but Sarah Bednarek is also included in Cynthia Broan's summer show which just got reviewed on artnet. Unfortunately Sarah's piece was not one of those mentioned, but I was glad to see the reviewer enjoyed Melanie Stidolph's two photographs. Commenter Peter - do you have any response to the James Westcott review? paris8, originally uploaded by Bromirski. The piece above is one of the ten or eleven or so I own by Paris, also known as Paris the Bum, also known as Holy Joseph. I say "ten or eleven or so" because Paris often drew on both sides of whatever scrap of cardboard or paper he was working on. Here is the other side of the piece pictured above. Paris was a center-city Philadelphia fixture when I lived there from 1986-1994. He wore aluminum foil turbans with big cardboard crosses, cinched his pants with ropes, wandered around softly muttering, and slept on stoops using his drawings as both sleeping mats and blankets. If he stayed on the same stoop long enough it too would be drawn on directly. He spent a lot of timed camped out decorating the stoop of the place that is currently the restaurant Alma de Cuba. I called him Paris because that's what he told me his name was but people also called him Holy Joseph. I know I was not the only person that collected his work - I remember going to parties and sometimes seeing his work on the walls - and other people collected his work as well. John Ollman bought stuff. 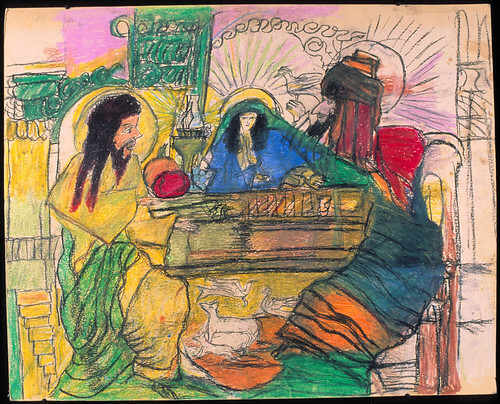 That must have been awkward - being an outsider art dealer with the real thing camped out down the block. I wonder if he has any plans to ever show those? One time I took Paris home thinking he could bathe or eat or something but it was no use, he just wandered around my apartment muttering. It was really hard to hear anything he said, he always spoke so softly, but most of what he said didn't make any sense. I left Philadelphia for Albuquerque in 1994 but a number of years years later took out a small ad in the City Paper describing Paris and asking anybody who might remember him to contact me, especially if they had any info, photos, or work. One guy did! I was given a lead to a homeless shelter that was familiar with Paris! In 2002 I was able to visit the shelter and the guy in charge had very fond memories of Paris. I think he was a favorite. The timeframe of that guy's and my own experiences with Paris overlap - and he knew Paris liked to draw - but he wasn't aware of the extent of Paris' art life. I was told that they tried to track down Paris' family and find out his real name but were never able to get anything solid - and one day a few years before my visit Paris just stopped coming to the shelter. The director did have a photograph of Paris that he reluctantly parted with to allow me to make a color copy of. My sense is that it was unusual for him to have personal snapshots of these "guests" - Paris must have made an impression on him as well. Here's the photo. This is pretty much how I remember talking with Paris, except we would be outside over a heating grate, his headpiece would be bigger and gaudier, and instead of blankets he would be covered in drawings. Actually, it looks to me like in this photo he is clutching at least one blanket-drawing. Also take note of the piece of charcoal and eraser on the shelf. Here are all my images of Paris' drawings. These are all done with crayon on thin cardboard. Lots of religous imagery. Beautiful birds here and here. The brown line drawings are especially faint in these scanned slides but I like the man and the little bird in the left of this one. Here's Jesus walking on water with "God Bless America" written across the bottom. My favorite might be this one because sitting atop this man's staff is another little man - so hard to see in this scan, sorry. What's this one about? Are those white servants waiting on wealthy blacks? Was this a desire or a memory? Most of the drawings that aren't worked on both sides include strange symbols or lettering on the back. Stars and/or moons. Is it Muslim? Similar to the moon and sun in this picture. Many of the buildings in the backgrounds look Middle Eastern. Last year I e-mailed Philadelphia artbloggers Roberta and Libby asking if they knew anything about Paris and they posted my query on their blog. Nobody contacted me but Roberta's post did include the information that Paris had been included in the show "Found Ground" at Moore's Levy Gallery in Jan. 1991. Now I have my own blog so I will ask again: Does anybody have any artwork by, photographs of, or remembrances of Paris? All of these paintings are from 2005. The first nine I've linked to previously; the second nine are the latest. This one was touched by Daniel Buren! sunflower21, originally uploaded by Bromirski. These digital prints were exhibited at Tadashi Moriyama's Freeform space in Philadelphia and mentioned by Roberta Fallon on her and Libby's artblog. Roberta and I are flickr friends and she also has just left another nice comment there. Thanks, Roberta. Keep clicking on the word "next" under the thumbnail to see each one. FYI - these are digital prints of stills from a video of shuffling photographs. The prints have the distortion, reflection, hands, blurring, etc - the original photos are very different and a different work, not just the same thing in different medium. First Roberta Smith spends half a NYTimes article reviewing the catalogue(!) and "preening, self-important personality" of Jean Helion and now Charlie Finch reviews the catalogue ONLY of Albright-Knox's Extreme Abstraction. What are you, bloggers?? Why does Roberta's review of Helion make me think that the more obsequious an artist might be the more likely she is to say something positive? Finch calls one painting "stunning", another "lush", another "surprising" - and adds "as with all great curations, "Extreme Abstraction" compels you to re-examine artists you may dislike or ignore." Wow! You guys are great! Super! The bar is set so high! P.S. The Albright-Knox website lists one of the Extreme Abstraction artists as "Arthuro" Herrera. I have a funny related Arturo Herrera story. How elegant! Artspace's first annual Sculpture Invitational opens August 26th with a walking tour beginning at 6pm at Artspace and ending with the final sculpture at Legend Brewing Company. This is a great idea, I'd especially like to see something interspersed - and related/reacting to - among all those Civil War statues on Monument Avenue. Maybe Allison Smith and those Muster people can come down next year and camp out on Monument? That would be a hoot. Here are some more Muster photos from Corny's flickr account. For those that don't know - Monument Avenue is a broad avenue with a wide park-like median dotted with huge equestrian statues of Civil War heroes like J.E.B. Stuart, Stonewall Jackson, Jefferson Davis, and Robert E. Lee. The last lonely statue on Monument is this one of Arthur Ashe. *bad sign - fourteen artists and only one woman? photo credit: Mike Lynaugh - The James River Rangers march past the "Stonewall" Jackson monument along Monument Avenue during the Confederate Heritage Parade in Richmond, VA. - here are more photos. One Day In The Garden, page 19, originally uploaded by Bromirski. page nineteen - the jury, famished, ate the judge. A few Richmond friends have been blogged this week. Okay, they might not live in Richmond now but this is where we met. All three are former VCU students and/or faculty. Allesandra Torres - is becoming very popular in DC. Amy Watson reviews Seven on Thinking About Art here. Lenny Campello has a photo and some links here. James Bailey has a crush and photos here. Bonnie Collura - Libby Rosof attended Bonnie's talk at University of the Arts (my old school!) and took a bunch of notes and photos. She even got one of Bonnie! Timothy Michael Martin - J.T. Kirkland has some very good things to say about (investing in) Mike Martin! "Should any speculative collectors be interested in Martin's work (he's in Strictly Painting now too) then his three large paintings in this show are steals. They measure (a guess) 48" x 48" x 6" and are priced at a mere $1,200. Should his career take off eventually we'll look back and wish we had bought these pieces at these prices. " Mass Moca blogged and blogged. Ann-Sofi Siden, originally uploaded by Bromirski. Corny here - not impressed with the Leipziggers. JL on his visit here - lukewarm on Leipziggers and enjoyed Cai Guo-Qiang. My post on Ann-Sofi Siden here - I loved Ann-Sofi Siden's installation, especially her film QM, I think I'll call her QM (or is it called QM, I think I call her QM? Anybody know for sure?). 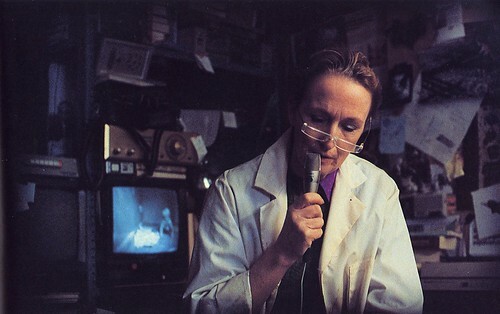 Above is a still from the film featuring an excellent Kathleen Chalfant as the paranoid put-upon Dr. Ruth Fielding. My second post on the other exhibitions here. Libby Rosof on Cai Guo-Qiang here and the Leipziggers here. JL responds to Libby's Leipzig painters post here. JL today with a link to a very good German article on the Leipziggers. Korean Min-Hwa, originally uploaded by Bromirski. The sweet William Blake piece linked to yesterday was one of the sources of inspiration for One Day in the Garden and above is another - Korean min-hwa, or folk art. The min means people and hwa means picture (I think hwa is the Korean equivalent to the Japanese e, as in ukiyo-e, sumi-e, etc). I spent six months in Korea and was given a nice set of books on min-hwa shortly before I left. Everything about this art is so different from everything I was familiar with - it was a whole new microverse. 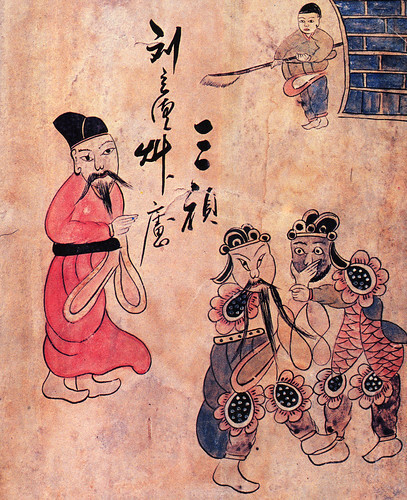 The two figures fighting(?) from the page above helped to create this scene and the guy in the red robe became the guy on the left here. Melanie Stidolph, originally uploaded by Bromirski. Above is the Melanie Stidolph photograph I liked from the current Cynthia Broan show and here is the William Blake painting it reminded me of. The two Stidolph photographs have stayed with me since my trip to Chelsea, and both make me think of Blake. I'm not sure why I think of Blake with this photo but I do. Someone wrote in the comments to this post that the Cynthia Broan show is forgettable but these Melanie Stidolph's photos have stayed with me. Anything that makes me think of William Blake must be good - This image from Blake's The Book of Urizen of Urizen struggling in the waters of materialism calls to mind the work of Kyoko Murase, and of course Blake's frontispiece to The Gates of Paradise is one of the inspirations to my One Day in the Garden. P.S. - Blake was a hater!!! John Frederick Kensett, Lake George, originally uploaded by Bromirski. Friday's post on Glens Falls, NY's Hyde Collection only talked about the work on permanent display in the Hyde's former home, but the museum is larger than that original structure and includes two other galleries for temporary exhibitions. 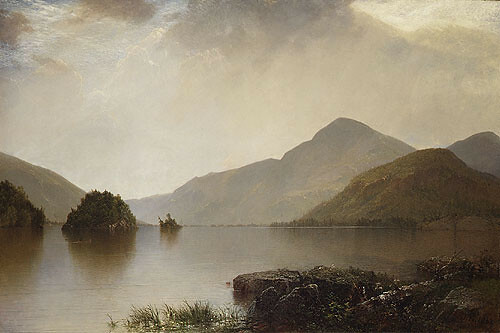 The larger of the two galleries has an exhibition entitled Painting Lake George: 1774 - 1900 full of paintings of nearby Lake George by artists like Asher Durand, Thomas Cole, William Bliss Baker, Sanford Gifford, John Frederick Kensett, Jasper Cropsey*, and many others. This is the third excellent exhibition of 19th C. American landscape paintings I 've seen in the past three years. The other two were the Pennsylvania Academy of Fine Arts American Sublime and the Metropolitan Museum's show of Sanford Gifford. Thank You!!! I had just been swimming in Lake George the day before so it was especially nice to see these. PIECES: collage, constructions & conceptual work is the show in the smaller gallery. 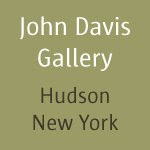 The exhibition includes small pieces by Joseph Beuys, John Chamberlain, Sol LeWitt, Betty Parsons, Judy Rifka, David Smith, Richard Tuttle, and others. I was drawn to the small black box by Louise Nevelson and a somewhat similar black sculpture by Bill Barrett - at first I thought that this Bill Barrett was the same artist who organized the Philadelphia Art Alliance's Sugamo Prison show but it is actually a different man. That Bill Barrette is spelled with an e at the end. *I'm sick of rainbows in recent paintings but still like seeing them in older work. Here's a Cropsey painting of Niagara Falls with a rainbow. So sweet. Why am I sick of the new ones? Is it because they are just bad paintings? Is it my jeaousy? The new ones are kitschy and the old ones aren't? I don't know. The newer one's colors are so flat and heavy. Where's the magic? Somebody point me to some good rainbow paintings. Phoebe Washburn, originally uploaded by Bromirski. Phoebe Washburn souvenirs installed on my back porch. Here they are in my driveway. So cute!